This has been a big year for our family. We bought a house. We adopted our first child. And I lost 60lbs. A lot of people have asked me how I finally did it. I say “finally” because I’ve spent most of my life trying to be not fat. I’ve always wrestled with a weight problem, stemming from working too much, eating too much of the wrong foods, and rarely exercising. I was always the fat kid in class. But not anymore. “So what’s your secret?” people ask. When they say that what they really want to know is what dieting techniques I used. But that’s not start when wanting to lose weight. I’ve spent years, decades really, wanting to be thinner, to be in better shape. I wanted to eat better. I wanted to want to exercise. I wanted to say no to the wrong kinds of foods. But wanting never got me, or anyone else for that matter, anywhere. 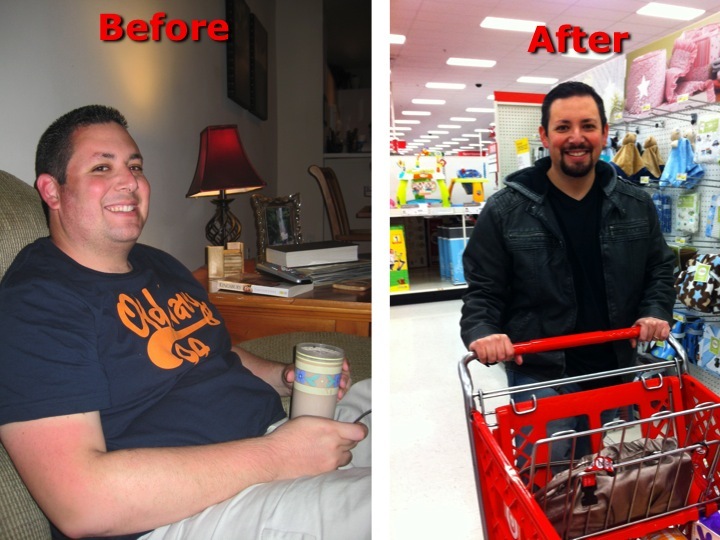 The BIG secret to how I lost 60lbs happened about a year ago. I was at some clothing store (probably Kohl’s, but I’m not sure). I went to try on a shirt that I really wanted and, as the story of my life went, it didn’t fit. He handed me back the shirt, turned, and continued on his way, not realizing that he had just taken a sledgehammer to my world and shattered it until it was a fine powder. I was visibly shaken and taken aback. “The Big and Tall Store?” I said a loud to nobody and everybody. For me that had always been the line. Up until that point I had always been the largest size at Kohl’s. That wasn’t great, but it was better than having to go to the Big and Tall store, which, you may have deduced, was not because I was tall. The Big and Tall store was always the line for me, the line I swore I would never cross. But that day I was at the threshold. It was then I realized I was at the proverbial fork in the road. I could keep going the way I was going, doing what I always did when I got depressed or discourage about my weight, which would be to down a couple of bowls of ice cream (extra fudge) with a side of Coca Cola. Or I could do something different, something better. I could change my trajectory. And that’s what I did. I decided I was done being fat. I was done being a size 42 waste that wears a XXL shirt (Now I’m a size 36 that wears a Large). I was done being ashamed to look in the mirror and be in pictures. I was done making excuses. I also had a future to plan for. Not just for my wife, as important to and me as she is, but for our daughter. When I had this epiphany a big piece of it was realizing that I was in no shape to be a dad. My energy level was dangerously low, I couldn’t really run, and I had frequent bouts of heartburn and sleep apnea. I was getting ready to be a dad and it was time to get my act together. I didn’t want my daughter to be ashamed of her dad or disappointed because I wouldn’t have the energy to play with her. That was not the story I wanted to tell. And that’s been my secret to losing over 6olbs in less than a year: The right motivation. I realized I was telling myself a bad story. I realized I was telling myself that I had always been a fat kid and so I always would be. I was telling myself I needed food to make me feel better. I was telling myself that losing this much weight was something only people on TV with million dollar trainers and all of America watching could do. I was involved in cycle of pain and self-loathing that was keeping me trapped in a body and a life that I didn’t want or need anymore. That trip to the store probably saved my life. If that salesmen hadn’t showed me where the road I was on was going I would still be headed that way, like a man driving in the middle of a snowstorm at night without any headlights. Next week I’ll talk more about the techniques I used to lose the weight. And it’s not as hard as you might think. I didn’t spend hundreds of dollars, or starve myself, or even set foot in a gym. But more about that next week. If you are feeling good about your weight, that is awesome. Whatever you are doing you should probably keep it up. Never take it for granted. It doesn’t take much to gain weight, but it takes forever to lose it! If you are like I was, not feeling too great about your body, I get where you’re coming from. I don’t have six-pack abs. I don’t even think you really should make that your goal. Living from a place of health, of being able to run and walk and dance and enjoy life. And maybe most important, being proud of who you see in the mirror. All of that starts with finding the right motivation. More than a goal, it’s your new story; the life that you’ve decided you’re tired of waiting to live. How inspirational 😀 You should be very proud of yourself, good for you! Thanks Jeff, this touched my heart! I am so proud of you! Love your story Jeff. What really got me to take action this year in eating healthy and exercising was last October, went to a conference in Las Vegas. Of course taking photos is expected. After seeing those photos of myself, had no idea how big I’d really got and that was my turning point.